Qinhui Garden locates on Qinghui road in Daliang Shunde, which is a masterpiece of southern classical garden art and it’s famed as one of the four famous gardens in Lingnan area. Qinghui Garden has been listed as provincial cultural relics protection unit. The overall arrangement of Qinghui Garden not only combines with the art essence of Suzhou traditional gardens, but also shows its quiet, natural and elegant charm to the visitors. Qinghui Garden finally forms a complete and featured Lingnan garden after five generations’ construction. Qinghui Garden, Foshan Liangyuan, Panyu Sanbanggulsa and Dongguan Keyuan are known as the four famous gardens in Guangdong, which are also the representative cultural spots in Guangdong. Qinghui Garden is sophisticated in building with a compact layout. It has high architectural art and presents a splendid sight to people. The garden has a clear structure and its building forms are very flexible. 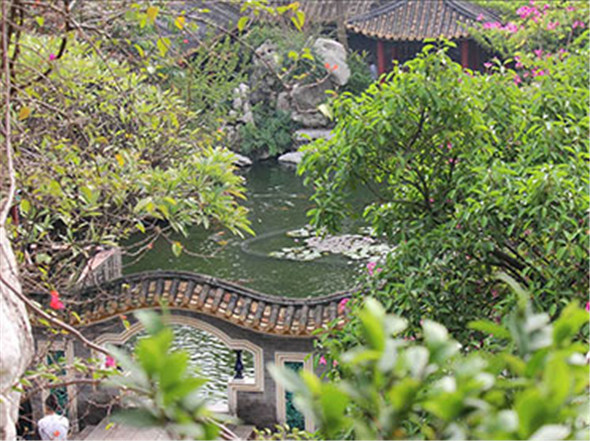 The whole garden is famous for its elegant and plain style of Lingnan courtyard, there are small gardens in Qinghui Garden and every step for you will be a different scenery. Qinghui Garden at present combine with Ming and Qing culture, ancient garden architecture with Lingnan feature, Jiangnan garden art and water village characteristics together, which is a charming scenic spot like a beautiful painting. There are a large number of ornamental ceramic, gray plastic, wood carving and grass in the garden. Rockery mountains are well arranged and water is flowing slowly in the garden. The “Yangcheng eight sights” dated back from Qianlong period in Qing dynasty is the only grass carving treasure preserved in the world at present, which is initially identified as a national heritage conservation.